Everything we've looked at so far as we make our way through Photoshop's various Brush Dynamics options has had one thing in common. They've all had something to do with the shape of the brush. We've seen how to dynamically change the brush size, angle and roundness with Shape Dynamics, how to scatter multiple copies of the brush tip with Scattering, how to add a texture or pattern to the brush with the Texture options, and how the Dual Brush options allow us to blend two different brushes together! In this tutorial, we move away from the shape-related features and into the wild world of color as we learn how Photoshop's Color Dynamics allow us to control the hue, saturation and brightness of our brush as we paint, and even how to randomly swap between our Foreground and Background colors! Click directly on the words Color Dynamics to access the options. Color Dynamics contains options for every aspect of the brush color, including hue, saturation and brightness. Only the Foreground/Background option at the top has a Control option associated with it. The Hue Jitter, Saturation Jitter and Brightness Jitter controls. Jitter, as we know by now, means randomness in Photoshop, which means we can use these options to let Photoshop randomly change these three aspects of our brush's color as we paint! Let's look at each of the Color Dynamics options more closely. Normally, Photoshop uses our current Foreground color as the color for our brush, so if we wanted to paint with red, yellow, blue, or whatever the case may be, we'd set our Foreground color to the color we wanted before we started painting. But why settle for painting with just one color when we can paint with two! The Foreground/Background option at the top of the Color Dynamics section allows us to switch between our current Foreground and Background colors as we paint! The Foreground (upper left square) and Background (lower right square) color swatches. Clicking once on the Foreground color swatch. Choosing orange for my Foreground color. 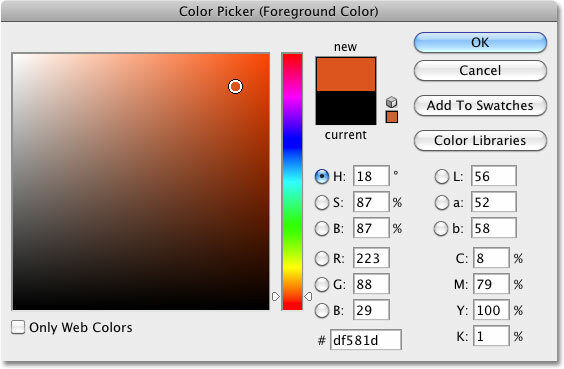 Clicking once on the Background color swatch. 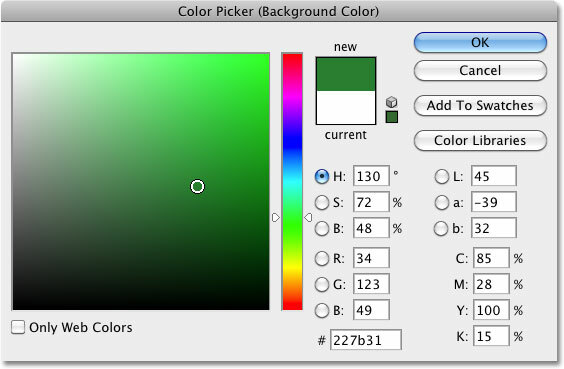 Choosing a medium green for the Background color. The color swatches now show the newly chosen colors. Since my Foreground color is set to orange, Photoshop paints with orange. Setting the Foreground/Background control to Pen Pressure. Photoshop now blends the Foreground and Background colors into the brush stroke based on pen pressure. Enter how many steps you want it to take to fade between the Foreground and Background colors. The color of the leaves fades from orange (Foreground color) to green (Background color) in 10 steps. Increasing the Foreground/Background Jitter option to 25%. Only 25% of the Background color is allowed to be randomly mixed in with the Foreground color. Up to 50% of the Background color is now being mixed in with the Foreground color. A jitter value of 75% means up to 75% of the Background color will be mixed in with the Foreground color. With jitter set to 100%, the Foreground color, Background color or any tint between the two can be used. Up next, we'll look at the Hue, Saturation, Brightness, and Purity controls! The Hue Jitter, Saturation Jitter and Brightness Jitter options in the Color Dynamics section of the Brushes panel all work in a similar way as the Foreground/Background Jitter option we just looked at. Each one will randomly control a certain aspect of our brush's color as we paint. The "hue" is what most people think of as the actual color itself, and by dragging the Hue Jitter slider towards the right, we let Photoshop randomly change the color of our brush. The further we drag the slider, the more variety we see in the colors. Dragging the slider towards the right to set the Hue Jitter value to 10%. The color of the leaves may be random, but with a Hue Jitter value of only 10%, Photoshop can only choose colors that are similar to the original. At 25%, we see a slightly bigger difference in the colors. Setting Hue Jitter to 50% lets Photoshop choose any color within 50% of the current Foreground color on the color wheel. There may not be many blue maple leaves in nature, but with Hue Jitter set to 100%, any color is possible. The Saturation Jitter control works the same way, but it randomly changes the saturation of the brush color as we paint. The default value is 0%, but by dragging the slider towards the right, we let Photoshop randomly adjust how saturated the color appears. The further we drag the slider, the more variety we'll see in the saturation. Dragging the slider towards the right to set the Saturation Jitter value to 25%. The Saturation Jitter value sets the limit for how different the saturation values can be from the original color. Your results will depend on your Foreground color's original saturation level. Let Photoshop randomly choose any saturation level it likes by setting the Saturation Jitter value to 100%. Dragging the slider towards the right to set the Brightness Jitter value to 25%. The Brightness Jitter value sets the limit for how different the brightness values can be from the original color. Photoshop can now choose any brightness level within 50% of the original. Setting the Brightness Jitter value to 100% gives Photoshop complete freedom to choose any brightness value. The Purity option below the Hue, Saturation and Brightness Jitter options controls the overall saturation of the brush color. Unlike the Saturation Jitter option we looked at earlier which lets Photoshop randomly change the saturation as we paint, there's nothing random about the Purity option. We can use Purity to increase or decrease the brush color's saturation by dragging the slider left or right, and it will remain unchanged until we adjust the slider again. If you're painting with both the Foreground and Background colors using the Foreground/Background option at the top of the Color Dynamics section, Purity will affect both colors. Purity controls the overall saturation of the brush color, and is completely separate from the Saturation Jitter option. Drag the slider towards the left to decrease the brush color's saturation. Lowering the saturation with Purity gives the leaves a more muted tone. Drag the slider towards the right to increase the brush color's saturation. Colors that were already highly saturated will not benefit much from increasing the Purity value. And there we have it! Up next, we'll finish off our look at Photoshop's Brush Dynamics with the sixth and final category, and also the one with the least interesting name - Other Dynamics! Or, jump to any of the other Brush Dynamics categories using the links below. Visit our Photoshop Basics section to learn more about Photoshop!